The Cabinet of Ministers of Ukraine approved the new rules for issuing visas to foreigners entering Ukraine. New rules were regulated with the current practice in the EU on these issues. The regulations came into force on September 10, 2011. New simplified classification of the types of visas. The new rules have only three types of visas: transit, short-term, long-term. Foreigners should submit the application for registration of short-term visa no earlier than 3 months before the planned trip. The decision on granting visa is taken within 15 calendar days from receipt of complete set of documents for the visa. 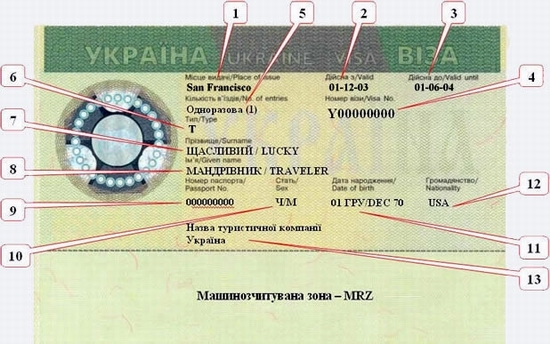 Passport document of foreigner must meet the following requirements: to be valid for at least three months after the declared date of departure from the territory of Ukraine, to have at least two free pages, to be issued no more than 10 years ago. The rates of visa fee for processing visa applications: single entry visa - 85 USD, double entry visa - 130 USD, multiple entry visa - 200 USD. The fee doubles for an urgent visa. Visa may be denied to foreigner if he/she doesn’t confirm the purpose of his/her visit to Ukraine; if foreigner has no documents proving an intention to leave the territory of Ukraine until the expiry of the visa. Absence of an insurance policy can’t be the reason for denial of visa. The refusal of visa must be motivated and formally presented to foreigner. The new rules provide registration of the certificate for temporary residence based on the long-term visas to persons arriving in Ukraine for employment; participating in projects of international technical assistance; working in religious organizations; working in public organizations; working in the representation of foreign companies; working in offices of foreign banks. In the case of a tourist trip: a copy of the confirmation of your hotel or a letter of confirmation from tour operator with signature and company stamp. In the case of business travel: the invitation of the Ukrainian tourist company or organization. In the case of a private visit: your friend or relative in Ukraine must obtain an official invitation from the local UVIR (Department of Visas and Registrations), which should be attached to your visa application.